Finding information is important. Build a sophisticated Zotero Technical Library on your PC to organized your digital assets. Finding stuff is a challenge. Some time ago, I stopped collecting hard copies and went digital. A few years ago, I used Zotero to organize my academic research library. Zotero is an open source tool for collecting, organizing, searching and sharing large amounts of research. 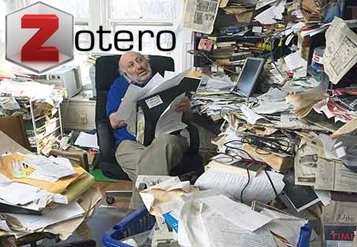 You will find Zotero widely used at universities. Basically, it’s just a database where you can insert or link to all sorts of digital documents – books, articles, web pages, and so on. But for my radio and making hobbies, no organization has yet emerged. My life is a lot like that depicted in the above picture shared from JuiceTank. (No, that’s not me, but close!) My point is that just because you shift to digital media, it’s still hard to find stuff without a little help. Wow. Like you, I have tried to sort these into folders and sub-folders by high level topics. Most of the documents are PDF and with Windows I can search text, but what I get back is a ton of hits without context or relevance. For comparison, my academic research library is similar size -13 GB with 4,400 files – and well organized. So, if you find yourself using Google ahead of your own document collection, the Zotero approach is for you. Zotero is easy to install and very well documented, as you would expect from its academic background. Basically, it builds a huge database (SQL) of documents and links. I will use links to existing documents on my PC. This works well as long as you have a common root directory, and save a lot of time by not needing to move files around. Simply add them as links. Once you add a document to your Zotero technical library, you can assign it to various collections. As you use each document, you can also add content tags to help you find topics across different collections or your entire library. Even better, you can add all sorts of notes or annotations to each document. What I am wrestling with right now is two things. First, what type of subject headings should I use. That decision was easy for my academic library as I basically used high level Library of Congress subjects. Second, should I bother trying to add my huge archives of magazine articles, which I have on CD? Anyway, time to stop thinking about this and get organized.